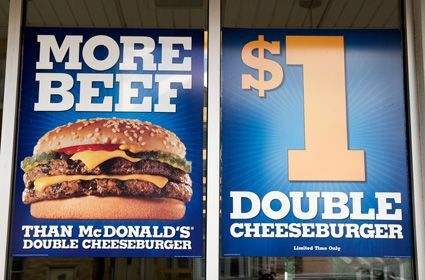 Burger King’s decision this week to raise the price of a double cheeseburger from $1 to $1.19 and to remove one slice of cheese from the double cheeseburger on its dollar menu (they now call it the BK Dollar Double) is a perfect example of the dilemma that major U.S. corporations are dealing with in the current economic environment. Their costs are going up on the producer level because of higher commodity prices and in a healthy economy, Burger King would have simply raised the price of the burger. However with demand weak, they are forced to cut their offering by giving you only 1 instead of 2 slices of cheese if you order from the dollar menu. For those people that still want 2 slices of cheese on their hamburger -- be prepared to pay up. While $1 menu items can boost traffic and sales, restaurant operators can lose money if too many of those sales come from money-losing items and this problem is exacerbated by rising prices. None of these options are good ones but this is the consequence of operating in a country with an unemployment rate of 9.7 percent. This is inflation -- disinflation in the works my friends. In the meantime, if you are hungry for a double cheeseburger, eat as many as you can by April 26 because that is when the price increase will be implemented!